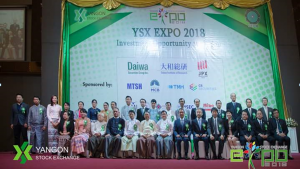 The second YSX Expo 2018 was held at Novotel Hotel, Yangon on 9th September 2018. At the Event, U Maung Maung Win, Chairman of Securities and Exchange Commission of Myanmar and Deputy Minister for Ministry of Planning and Finance and Mr. Takao Ochi, State Minister of Cabinet Office delivered the opening speech. Yangon Region Minister for Ministry of Planning and Finance, Members of Securities and Exchange Commission of Myanmar, Managing Directors from Yangon Stock Exchange, Officials from the Governmental Organization, Officials from the Union of Myanmar Federation of Chambers of Commerce and Industry ,and Myanmar Institute of Certified Public Accountants, Listed Companies, Securities Companies, Tokyo Stock Exchange , Daiwa Securities Companies ,and the potential investors attended the Events. There are 878 attendees at this Events. After that , U Aung Naing Oo , Managing Director of the Directorate of Investment and Company Administration explained about “the Public Company, Capital Market and Economic Development “, and U Kyaw Myo Tun, Financial Advisor discussed ” Investment Opportunity in Equity Market ” respectively. In the event of Panel Discussion, U Htay Chun , Members of Securities and Exchange Commission of Myanmar, Seniors Executive Officers from the Yangon Stock Exchange and Expertises presented about “the Future Business Outlooks of Listed Companies” and “the Invigoration of Myanmar Securities Market” .